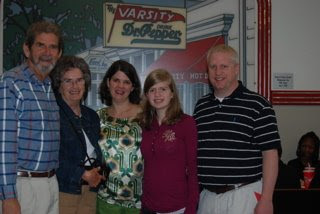 ...With my Mom and Dad, Savannah and DH at the Varsity in Atlanta! 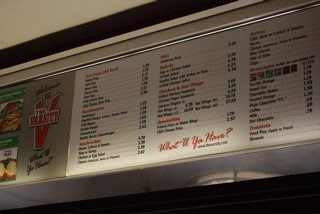 We have been going to the Varsity since I was tiny! 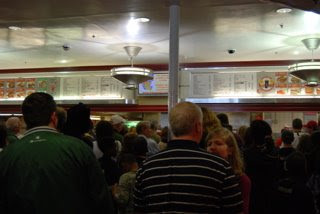 After my sister and my brother-in-law's wedding reception, we all (including bride & groom) headed to the Varsity to celebrate. It was after midnight when we got up there and my grandmother even went! Now every time we are in Atlanta, DH has to have his Varsity. These pictures were taken when we were flying to Savannah, Ga and we missed our flight out of Atlanta. Well, next thing we knew, we were renting a car, and calling mom and dad to meet us at the Varsity. It was a really happy day! 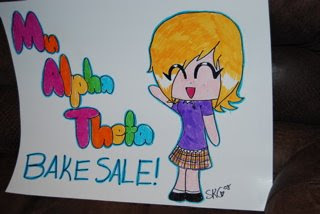 Savannah was in charge of making the bake sale sign for her Mu Alpha Theta math honor society that they are having on Thursday. Isn't it adorable?! She drew herself in her school uniform! I know, I know...who would have ever thought I would have a child in a math honor society, when I could only get through fractions. Thank heavens she got those genes from her daddy. 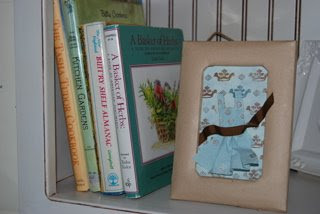 My very wise, artistic friend made this little picture frame with the colored tissue paper apron with ribbon for me. She has been married for 40 years or so and is blessed to have her own incredible DH (dear husband). 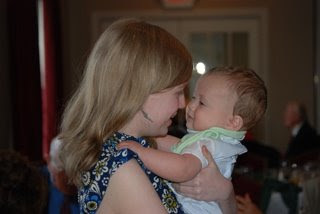 We have been in Bible study together for 20 years or so on Monday's and she is the mother of Clare (who we are going to visit in June), little Phil, Lyle and grandmother to 6 grandchildren. "Apart from putting on my material apron, I am challenged to put on the attitude apron. I Peter 5:5 says, 'You must all put on the servant's apron of humility to one another, because God opposes the haughty but bestows His unmerited favor on the humble.' The apron is an emblem of servant hood. It's good not only to put on our apron, ready to work hard in the home, but to have the same attitude in our hearts. When we wear the servant's apron of humility, no task will ever seem too menial or too difficult to accomplish with God's presence and power." God bless you, precious wife, friend and mother. You are truly a blessing to me and your home--the world will never be the same because you are learning to know, love and serve your Savior. 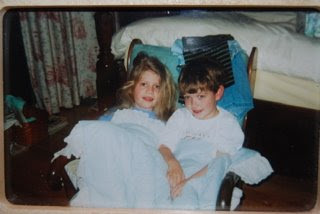 I absolutely LOVE this picture of Savannah and Nicholas in the chair together. This was Christmas Eve and they were hoping to hear Santa's jingle bells outside. They had already spread the reindeer food on the front lawn. They are both under Savannah's Peter Rabbit baby quilt that she used and then became Nicholas's favorite blanket that he carried with him everywhere. They were sleepy, excited and just so, so happy to be together. I know what they mean. There is nothing like childhood and being with the ones you love. Nicholas would take Savannah's hand and just kiss, kiss, kiss it over and over. It was like he was Savannah's subject and she was his princess. She would be patient and just wait until he was finished. They said they heard Santa's sleigh bells that night and Savannah said she squeezed her eyes shut real tight, in case he might know she was still awake and would pass by. Magic and memories did visit our home that night, in more ways than one. 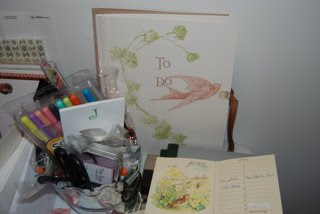 I can't believe it has been over a week since I blogged! I have been in my storage areas cleaning out and the past two days I had a garage sale with two other friends. We had a good sale. The weather cooperated and I was able to get rid of some things and make some spending money for my upcoming trip. 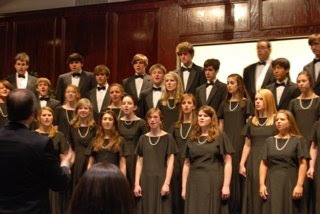 Savannah has had chorus performances the past 3 Sunday's and there have been lots of church get- togethers. I feel like I have been busy, busy, busy. Franklin's 'Main Street Festival' is this weekend and it is always lots of fun. Savannah and I will probably walk around tomorrow after lunch at church. Billy Smith from Freed-Hardeman is coming to speak tomorrow and we are having lunch on the grounds. The festival is listed in the top ten things to do in the South, and with the weather good, there are usually around 100,000 people that come through the weekend. Lots of incredible artisians, crafts, great food, cool jewelry and always cute dogs on leashes with their owners. Franklin is such a great place to live! One more week until the church ladies retreat next weekend and then the next weekend Les and I are off for our fun weekend. Today has been a lovely, quiet day. DH (dear husband) picked Savannah up today from school and I hung out at home. I read, watched some 'Top Chef', did laundry and just enjoyed our beautiful Spring weather. DH has two softball games tonight, one at 8:00 and one at 9:00 pm. That is so late to me. I don't think I'll make it to those. I've got to go sometime, I have missed the last two due to book group. Hopefully, next weeks will be earlier. A friend from church also asked him to play golf tomorrow, so he is happy. He came in and said, "Do we have anything going on tomorrow?" I love how they ask that question before they tell you what's up. Smart. Savannah is happy tomorrow is Friday and the end of a school week. The new 'Dr. Who' comes on t.v. tomorrow on the Sci-Fi channel and we are fans. They tape it in Wales in England and she says she wants to take an extra duffle bag when we travel to Wales this summer so she can look for Dr. Who memorabilia. We watch maybe three t.v. shows: Dr. Who, Moonlight, and Top Chef. We're not big t.v. watchers around here. I read and Savannah draws. Now I am NOT talking about DH. He unwinds at night flipping the t.v.. Uuuuggggh! I have my eyes closed in bed and it is like flashing behind my eyelids, because he can't leave it on one channel....but I still love him. Other news...Nicholas (my nephew) has gotten a new dirt bike. He is twelve and was so excited when he told me on the phone. Please be careful Nick...he's still that cute little baby I watched being delivered! This is a whole new ball game when those you love start riding motorcycles. I don't know why I am complaining, I had a real motorcycle license at 16 and rode all over town. Things are just so different now on the roads. Nick's a great kid, so he'll probably be safe...or his mama will get him. My luncheon went off great! I had been cooking and chopping for two days and today everything tasted delicious! I even made home-made croutons! Judy shared our lesson, maps were passed out and 21 ladies came to lunch. I had 22 plates in the house, so it worked out perfectly! Jodie came down and brought clippings from her garden, so I had beautiful flowers around the house and DH vacuumed and Savannah cleaned her bedroom and bathroom. It was so nice to serve these special ladies. I think everyone had a nice visit. Maybe I'll make it a yearly gathering. Tuesday morning I met my friend Kimberly at her house and she drove us to Dickson, Tennessee to the famous 'Miss Mables tearoom'. It was everything and more! Muffy and Jeana met us there and we had a girls lunch out and it was so much fun. We ate, shopped and ate a little more! We all caught up with each others lives and had a fun, frou, frou day! Thanks Kimberly! I am tired. This post is actually 2 hours later than it says. I can't figure out how to make the time right for this blog. So when it says 4:31 am, it's really 6:31 am. I do not get up that early. My morning started out with my weekly Monday morning Bible study with Elaine, Jodie and Cindy. We talked about patience. It seems to be a struggle for all of us. I think the Lord is just shaking His head at all of us. But it is good to get together to pray and encourage each other. I am so thankful to have these ladies in my life. Elaine is in her 60's, Jodie is around 55, Cindy is 50 and I am 42. I have known these girls for 20 years and I am so thankful they took me under their wings and have mentored and been my friends for all these years. 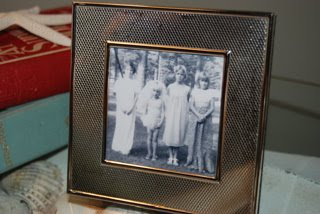 When DH (dearest husband) and I moved in next door to Jodie and her family, we realized we were kindred spirits. Since I got married so early, she was a blessing to have next door. Anyway, after Bible study, Jodie and I went to find 2 plant stands for each side of my front door. We found 2 downtown Franklin, brought them home and we hope to put ferns in them tomorrow. Then I had to do a ton of grocery shopping. Publix and Kroger to find everything. I am having 18 (possibly more) here on Wednesday after my Southern Hills ladies Bible class. We are getting close to ending for the summer and I wanted to do lunch for our special teacher and group. Tonight I made 2 loaves of orange bread (orange zest and all), the basil mayonnaise for the chicken club salad, and the frozen banana/cherry salad. I think it is all going to be scrumptious. I'll finish the rest up tomorrow afternoon and Wednesday early. Somewhere in there I have to clean my house too. Oh, tomorrow my friends Kimberly, Jeanna and Muffy are taking me for a belated birthday lunch to 'Miss Mable's Tearoom' in Dickson, Tennessee. I have heard wonderful things about it and Kimberly is a doll for getting this together. I'll tell you all about it tomorrow. So, I am a 'good' tired. 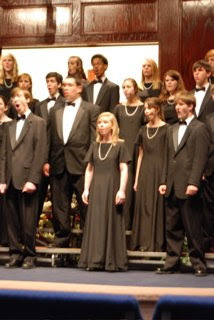 Tonight Savannah sang with her 'Concert Chorus.' It was incredible! 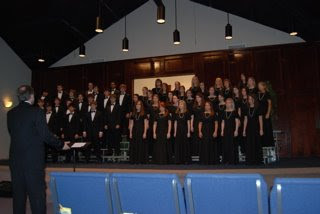 Last week they performed at their state chorus finals at Belmont University and they won the top honor. They bring me to tears every week! 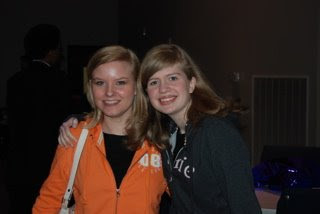 Here are some pictures of their concert tonight and Savannah and her best friend Amy. ...we slept in to 7:30am, which is good for DH. ...my dogs have dirty faces from trying to dig up moles in the yard. ...I listened to the wind. ...Savannah says she tried on her 'dream' dress. ... I watched a male and female cardinal play in my bird bath. ...I ate lunch at a restaurant alone and read. 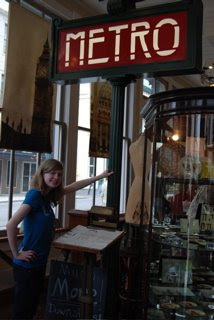 ...I had to make myself be patient and pleasant in a check-out line. ...I have not done my laundry. ...I am thankful it's Spring. ...I had to take an Advil cold & sinus because it's Spring. This is my escape closet. 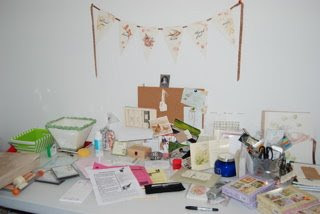 I come in here to write my cards, wrap gifts, repair things, and just disappear for a while. 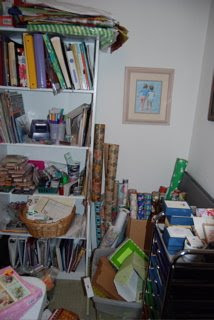 Savannah loves to scrapbook in here. I got my idea from seeing my smart friend Laura's scrapbook closet she built and another friend Shana has made a room of her own with her mother's old kitchen cabinets and countertops. Smart and fun! 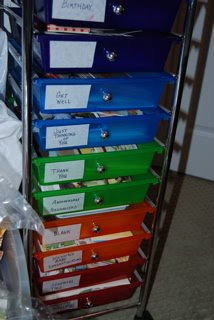 I have my cards sorted by type in a little drawer module so I can find what I need quickly. 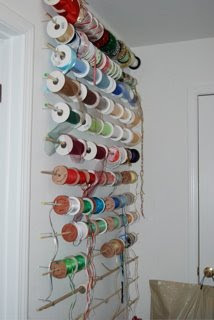 I bought some small dowel rods and some curtain extender screws and hung up all my ribbons, raffia, and tulle on one wall so I can find exactly what I need. It is still a work in progess, but I am very proud of it. 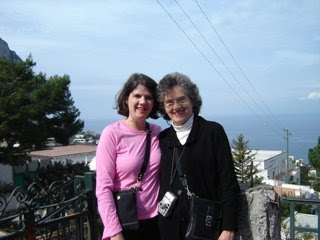 Last year my mom and I went to Italy with a bunch of ladies from my mom's church in Peachtree City, Georgia. There were nine mother/daughter groups and a few other ladies. We had a blast! 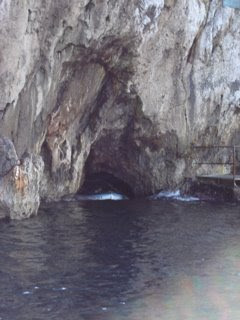 I was thinking about this amazing place we visited on the island of Capri called 'la Grotta Azzurra' or the Blue Grotto. 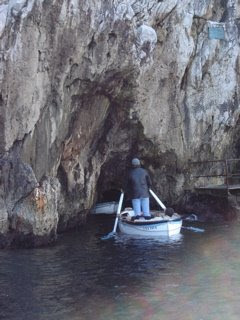 It was the first day of the season that the water was lower and open enough for the little boat to get into the cave. We started out in a larger boat and then four people got in the little row boat, including the one guy who rows . We pay our money and then he rows us over to the cave opening and explains what we have to do. First, he has to time it just right with the waves so our heads don't smash into the top of the cave opening. He yells for us all to lay down in the boat like dominoes and he grabs the chain along the side of the opening, times it right, and yanks us through as he lays down too to shoot us in the opening. You can see in the first picture the group ahead of us already laying down. In the second picture, you are able to tell just how small the opening is. Well, it was so funny! The picture where you see hands over a face is my friend Charlotte (yes, your mother Mandy), and she is laying in my lap screaming bloody murder. Scary, but so funny! It was so narrow through there! We (me, my mom and Charlotte) all thought our faces were going to be scraped off! You have to lay back flat in the lap of the person behind you. Well, we got in the cave in one piece and inside was AMAZING! The water was the most beautiful blue you can imagine! 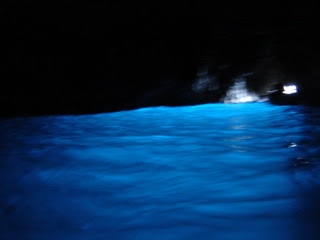 The little light that comes in somehow makes the water glow this incredible color. It was one of the most beautiful sights I have ever seen. I was able to video a little bit inside with our boatman serenading to us as we try to sing along. It was SO MUCH FUN!!! Click play. I was so proud of my mom! She is where I get my fearlessness from, I think. There were some in our group who wouldn't do it. Yay me, mom and Charlotte!! This was only ONE of our fun stories! 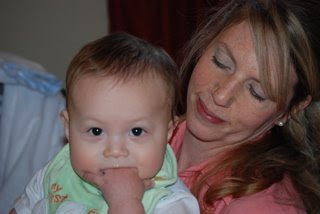 Today my precious nephew Jax and sister-in-law Julie (DH's sister) took me out for my birthday lunch. We went to Meridee's in Franklin for our favorite chicken salad/fruit plate, Julie's treat. Thanks Julie and Jax! It was delicious, so quaint and the company was so, so sweet! Jax is a little bundle of joy to his mom and dad and all of us older folks love, love having a little baby in the family again. Savannah is in LOVE with him. We all are really. 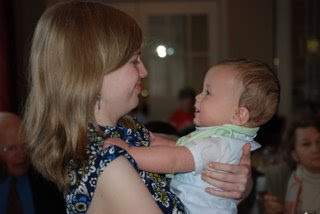 We all start talking silly and he has DH's parents totally wrapped around his cute little finger. He is just starting to scoot on his tummy and is keeping Julie on the move. 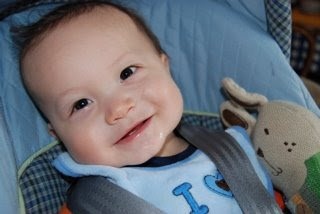 He has two new baby teeth and is such a happy baby! Julie takes him for daily walks and has already almost lost ALL her baby weight! She is even going to run 13 miles in an upcoming Music City Marathon. I am so proud of her! The two pictures of Savannah and Jax were taken at Easter brunch and Savannah said they were giving each other Eskimo kisses. Aren't they sweet! Father comes home when his work is done. And love lights up the care-worn face. Swift as he turns his own latch-key. When father goes home with his day's work done. All those ladies were smelling candles. 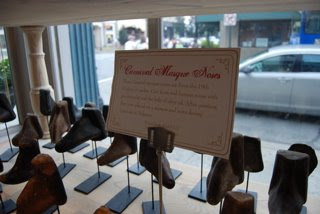 It says they were each molded on real human noses in the 19th century to make the mask. I couldn't believe that! 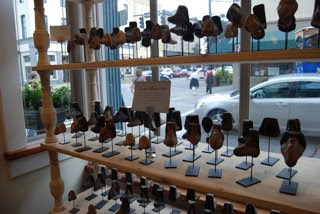 Take a look at some of those long noses! ...and they were going for $140-$170 a piece! People will collect anything.......fun to look at though. 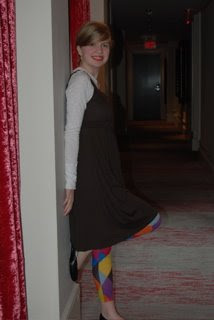 This last picture is of my 'Sunshine' just before we went out to dinner. Ephesians 5:33 "...let the wife see that she respects and reverences her husband--that she notices him, regards him, honors him, prefers him, venerates him and esteems him; and that she defers to him, praises him, and loves and admires him exceedingly." "Keep our joy... it's the best weapon against Satan." "Every time you die to your dissapointments, you become closer to Jesus." "Let God go before you and fight your battles." "Don't just give a generic apology. Be specific in your apology." "In offering an apology, am I just trying to be justified? Be careful." "Respect is a man's motherword. Don't wait until we think they deserve it." Sometime days just turn into a race to get through to the end. So it's nice to have some books I know I can count on that help me slow down and reflect on the most important things. My Utmost for His Highest by Oswald Chambers and Streams in the Desert by L.B. Cowman are two books that I enjoy every year. They are daily Christian devotional books that always have great food for thought. One of my favorite times of the day is when it is time to go pick up Savannah in Nashville. I usually leave home at 1:45 so that I can be in the car when Daily Bible Hour with Alexander Scourby comes on my 980AM Nashville station. It is from 2:00-2:15 every day with 3 or 4 chapters read every day at the same time. He has this deep, beautiful voice that you can't help but fall into the scriptures. We are back in Tennessee after a whirlwind trip to Savannah, Georgia! The time we had there flew by, so that is usually a sign that you have had fun. 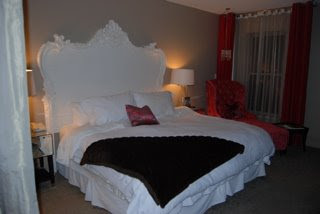 I had to include some pictures I took of our room at the Mansion on Forsyth Park. 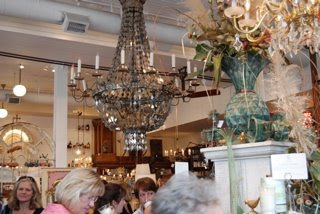 It was this big Victorian, with bohemian decor. Lots of greys, silvers, cranberry velvet, crystal, and mirrors. I loved it! Can you see that HUGE tub? 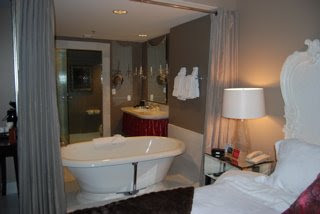 It was like a swimming pool sitting in between the bed and bathroom. DH was a little freaked out by the glass water closet door, that you could see directly into the shower and bathroom all the way to the bed. 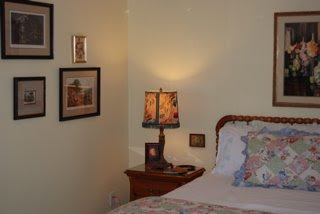 There were curtains you would draw around the tub and draw together when you went into the main part of the bathroom. Not enough privacy and too much exposure for DH. 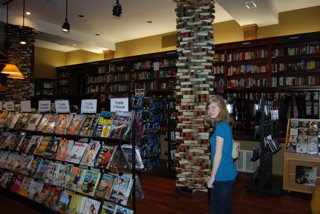 Savannah was in her element at the Savannah College of Art and Design bookstore 'Ex Libris.' They have four floors of art supplies. She was in heaven. 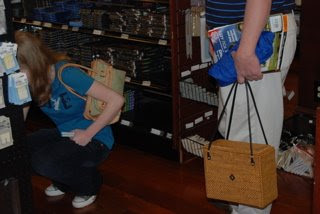 I am especially proud of this picture of DH holding my purse for me. Inez has been a part of our lives now for about 16 years. She started coming to help me clean my house when I had my femur replaced in my leg. She has been putting up with me and DH's antics ever since. Sometimes she is vacuuming, and the plug is around the corner from where she is working and I will unplug it, and it is so funny to hear her flicking the switch back and forth trying to figure out if she has killed the vacuum or not. Another time, I went outside and knew she was wiping down the windows inside and I jumped in front of the window and about gave her a heart attack! She and DH sass each other back and forth with good fun and she is his biggest fan. He even got her a Land's End T-shirt with Super John flying on it and she wears it (not to clean in she says, because she doesn't want to get bleach on it) and she LOVES it! I won't even do that. My dogs love her more than they love me. And she loves them right back. The running joke around here is that I'll get rid of DH before I get rid of Inez. Thank you Inez for being a blessing in our lives. We love you!!! p.s. She's babysitting the pups this weekend for us. What a gem! These are a few of my favorite old pictures. 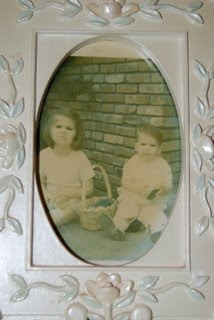 My sister and I at Easter. (Yes, I look like a boy) I just love the look on Leslie's face. Classic Les. 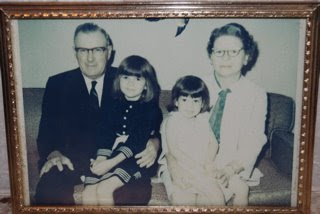 Leslie and I with our Nonnie and Grandaddy in Mississippi. Nonnie is patting my leg and Les is actually not singing or mothering me. I got a few spankings from Les. And the next one is me, a little neighborhood kid, Kay and Maggie all in our dress-up clothes. We are not sure why none of us are smiling, but we LOVED dress-up! 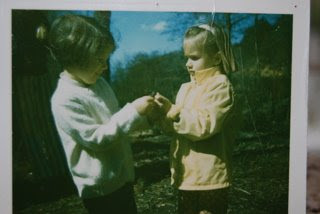 And the last one is of me and Maggie holding a frog between the two of us when our families were camping together. Kay and Maggie were bridesmaids in my wedding. 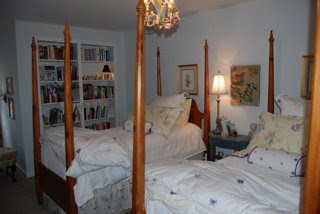 My two guest bedrooms are both named. 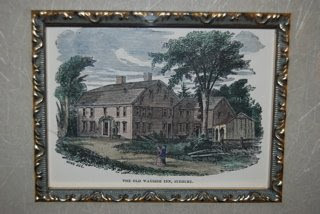 One is the Austen room and the other is the Longfellow room. 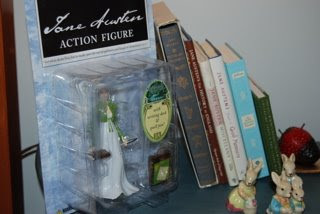 One has lots of Jane Austen books, including a Jane Austen action figure and the other has everything you need to know about Henry Wadsworth Longfellow. Once when my sister and my crazy, loveable, dry sense of humor brother-in-law were up from Geogia spending holiday with us. 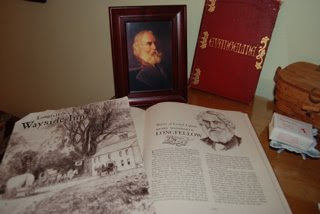 He was coming out of the bathroom with his reading material he had gotten from his room and said to me, "Don't you have anything else to read around here that's not about some guy named Longfellow?"